Last year, when the opportunity to go to "family camp" we didn't really know what we were getting ourselves into. Neither David nor I had ever done any vacations that structured/organized with our families growing up, and I personally had never even been away "to camp" but rather had just heard accounts from my brother and friends of the epic experience it would be. You guys, despite all I had heard, I was not prepared for how amazing an experience it would be to go to camp as a family. Last year, we fell in love with Forest Home. This year, as we prepared to go back for year two, anticipation was high, and all five of us were counting down until it was time to go. Of course, with all of the activities on the docket, the fun-meter at family camp is basically off the chart. 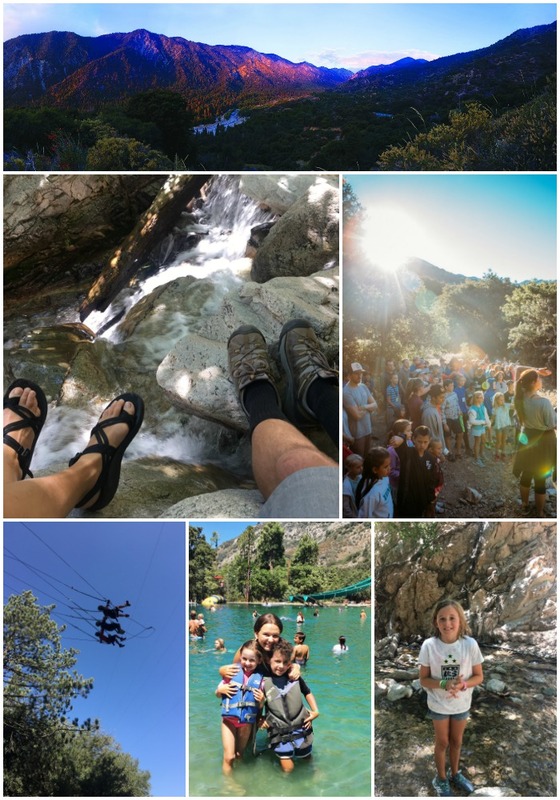 The kids could talk your ear off about the Giant Swing, the ropes course, mini-golf, the craft cabin, the pancake breakfast hike, and Lake Day (our family's favorite day of camp). But here on the blog, I thought I'd share the aspects of camp that pull on my mama heartstrings the most, and what makes family camp a true vacation for parents (spoiler: free babysitting. Nope, not a joke). And, bonus: it's such a short drive off the beaten track (aka Redlands/I-10) which is great because I love the mountains but I don't like scary mountain roads. People come to Forest Home from all over (we met a family from England this year! ), but if you live in Southern California it is is especially convenient, while still feeling worlds away. Family time, friend time, alone time. Fun time and down time. Family camp offers such a good balance. The extroverts get plenty of friend and family time (we spent every evening playing cards in the clubhouse), and the introverts can hide away in the cabin or in nature anytime the schedule feels like too much. Everyone gets poured into and gospel-refreshed. Our kids get time in their classes that is like a VBS, but even better (I loved the new trail adventures where they studied the word while out adventuring). And the grownups get the word taught twice a day (we were so encouraged!) with lots of time to worship God through music, too. Yummy meals and tasty snacks (ie milkshakes! ), and coffee to boot. The kitchen staff is amazing and the Clubhouse is known for its delicious shakes and addicting fries. The coffee shop is fun to have as a treat option, although I love that they set up free coffee stations early each morning for the early-risers. Enjoying creation, and getting away from daily life. Plus, fresh-picked blackberries for dayzzz. The mountain setting is so beautiful and rejuvenating to the tired soul. All along the creek are berry bushes, and we were there at just the right time to get to see (and enjoy) the berries at their ripeness, too. This year we also did a little hike at Big Falls down the road from camp which was super fun. And of course, the CCA program (aka babysitting every night, and I mean that includes not dealing with bedtime). Each family is assigned a CCA (childcare assistant) who loves on the kids each evening during the teaching/worship/free time, and what a blessing it is to have all that time together as a couple! Hands down, this program is one of the best parts of Forest Home family camp, and I look forward to sending my girls up to be CCAs some day, too. If you're curious about Family Camp or have any questions, I'd be happy to answer. We just love it so much!